Practice Operating System questions and answers for interviews, campus placements, online tests, aptitude tests, quizzes and competitive exams. This set of Operating System Multiple Choice Questions & Answers (MCQs) focuses on “Memory Management”. 3. Which one of the following is the address generated by CPU? 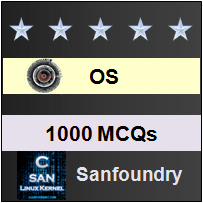 Sanfoundry Global Education & Learning Series – Operating System. Here’s the list of Best Reference Books in Operating System. To practice all areas of Operating System, here is complete set on 1000+ Multiple Choice Questions and Answers on Operating System.